Orphanage – Giving Street Children Another Chance…. Its been awhile since we have updated this post! So many things to report on and what shall I say? Lets talk about an orphanage that we are involved with, "The Samaritan Trust". This is an orphanage that takes vulnerable children, or children that have been begging on the streets and gives them a home, schooling, and food. Twenty former street kids have graduated after undergoing vocational training for a year at Samaritan Trust Centre in Blantyre. The trust trained the young people in tailoring, brick layering, carpentry and electrical installation. The organization’s aim is to reduce the number of street kids in the country’s cities. In her remarks following the graduation, the trust’s executive director Margret Mukwena said the training is an effective way of dealing with rise in number of street kids. She further said that it is not easy to take care of the children since they get exposed to different abuses in the streets. “It is difficult to take care of such children as any child because they are exposed to different abuses since they have no one look after them,” she explained. Mukwena said even though her organization is facing a lot of problems, it will continue to train more young people. We give each of these graduates a Bible and songbook as a graduation gift each year. Our organization has been providing food for these children since 1995. Our mission director, Calvin, helped to start this along with the late Jervase Chakumodzi. We have a service here every two weeks in the evening and you should hear these children sing! It's one of the more rewarding things we are able to do here. There are around 60 children, mostly boys, but around 12 girls also. They are good kids, even though they come from difficult circumstances. They have hopes and dreams for the future; ask any one of them what they want to do when they finish school and they will have an answer. Lack of nice clothes and shoes does not keep the smiles from their faces; their joy is contagious and we have come to love each and every one. Around Christmas time we knew that most of the kids would be going back to their home villages to stay with relatives or friends over the holidays for about one to two weeks. We also received a small donation from a school in America for them at this time. We donated to them each a blanket and a book bag. Then for some of the older ones we gave them small calculators, geometry sets, and backpacks. 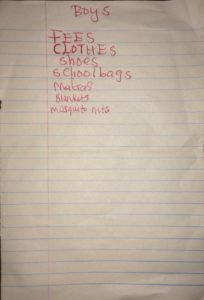 Here are the list of items that they need written directly from the children! We told them to list the most important things first! If anyone would feel in them to help some of these children with these items we have our own misssionarys on the field to help with the donation so that it gets taken care of in the right way. Again, thanks for all your prayers and donations! 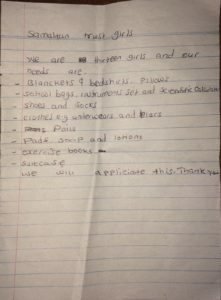 Posted in Malawi News | Comments Off on Orphanage – Giving Street Children Another Chance….